Joan Anita Barbara Armatrading, MBE (/ˈɑːrməˌtreɪdɪŋ/, born 9 December 1950) is a British singer-songwriter and guitarist. A three-time Grammy Award nominee, Armatrading has also been nominated twice for BRIT Awards as Best Female Artist. She received an Ivor Novello Award for Outstanding Contemporary Song Collection in 1996. In a recording career spanning 46 years, Armatrading has released 19 studio albums, as well as several live albums and compilations. Joan Armatrading, the third of six children, was born in 1950 in the town of Basseterre on the Caribbean island of Saint Kitts. Her father was a carpenter and her mother a housewife. When she was three years old, her parents moved with their two eldest boys to Birmingham in England, sending Joan to live with her grandmother on the Caribbean island of Antigua. In early 1958, at the age of seven, she joined her parents in Brookfields, then a district of Birmingham. The area, now mostly demolished, has been absorbed into the district of Hockley. Her father had played in a band in his youth, later forbidding his children from touching his guitar. At about the age of 14 Armatrading began writing songs by setting her own limericks to music on a piano that her mother had purchased as "a piece of furniture". Shortly thereafter, her mother bought her a £3 guitar (equivalent to £57 in 2018) from a pawn shop in exchange for two prams, and the younger Armatrading began teaching herself the instrument. Armatrading left school at the age of 15 to support her family. She lost her first job (as a typist and comptometer operator) after taking her guitar to work and playing it during tea-breaks. Armatrading first performed in a concert at Birmingham University for her brother at the age of about 16. She only knew her own songs, but her brother asked her to perform something that would be familiar to the audience; she chose "The Sound of Silence". She then performed her own songs around the local area with a friend from school, and played bass and rhythm guitar at local clubs. In 1968, Armatrading joined a repertory production of the stage musical Hair. There she met the lyricist Pam Nestor in 1970, and they worked together on Armatrading's debut album Whatever's for Us, released by Cube Records in 1972. Nestor wrote the lyrics to 11 of the 14 songs on the album, while Armatrading wrote the lyrics to three of them, performed all the vocals, wrote all the music and played an array of instruments on the album. Although Nestor was credited as co-lyricist, Cube considered Armatrading to be the more likely star material. These events produced a tension that broke up the partnership. On 28 November 1972, Armatrading appeared on the BBC Radio 1 John Peel Show performing "Head Of The Table", "Spend A Little Time", "Child Star" and "Whatever's For Us". She sang and played acoustic guitar and piano. In 1973 Armatrading's first single "Lonely Lady" (with lyrics by Nestor), a song that had not been included on the album, was released by Cube on the Fly label (catalogue: Bug 31). It was unsuccessful in the charts and a period of inactivity for Armatrading followed while she extricated herself from her contract with Cube Records. The single was subsequently withdrawn by Cube and re-released as a promotional single in the US by Armatrading's new label A&M Records, the same year (as A&M1452). In January 1974 she appeared again on the John Peel Show. Performing "Some Sort Of Love Song", "Lonely Lady" and "Freedom", she again sang and played acoustic guitar and piano, but was accompanied by supporting musicians Snowy White (guitar), Mike Tomich (bass) and Brian Glassock (drums). In 1975, Armatrading was free to sign with A&M Records, and issued the album Back to the Night, which was promoted on tour with six-piece jazz-pop group The Movies. 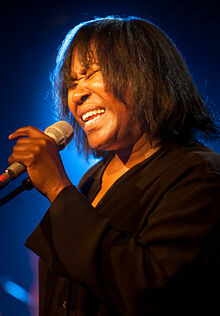 Armatrading credited English singer Elkie Brooks on the sleeve notes as she had cooked for Armatrading and the band in the studio while they had been making the album, which was produced by Brooks' then husband Pete Gage. A major publicity relaunch in 1976 and the involvement of producer Glyn Johns propelled her next album, Joan Armatrading, into the Top 20 and spawned the Top 10 hit single "Love and Affection". The album mixed acoustic work with jazz-influenced material, and this style was retained for the 1977 follow-up Show Some Emotion, also produced by Glyn Johns, as was 1978's To the Limit. These albums included songs which continue to be staples of Armatrading's live shows, including "Willow", "Down to Zero", "Tall in the Saddle", and "Kissin' and a Huggin'". Also at this time, Armatrading wrote and performed "The Flight of the Wild Geese", which was used during the opening and end titles for the 1978 war film The Wild Geese. The song was included on the soundtrack album for the film, originally released by A&M Records, later released under licence as a Cinephile DVD. A live album entitled Steppin' Out was released in 1979. Between 1972 and 1976 Armatrading made a total of eight appearances in session for the John Peel show and the decade saw her become the first Black British female singer/songwriter to enjoy international success. Armatrading was the musical guest for Season 2, episode 21 of NBC's Saturday Night Live, which originally aired on 14 May 1977. She performed "Love and Affection" and "Down to Zero". In 1980, Armatrading radically revised her playing style and released Me Myself I, a harder pop-oriented album produced by Richard Gottehrer, who had previously produced albums for Blondie. The album became Armatrading's highest ever charting album both in the UK and the US, while the title track became her second UK Top 40 hit single. In that year, she performed on Rockpalast night. The same pop style as on her previous album, now coupled with synthesisers, was also evident on the 1981 album Walk Under Ladders and 1983's The Key. All three of these albums were Top 10 successes in the UK, with The Key also producing the hit single "Drop the Pilot", Armatrading's third UK Top 40 hit single (UK #11). To capitalise on her success, A&M released the best of compilation album, Track Record in 1983. Armatrading performed in 1985 at a sold out concert at the Red Rocks Amphitheater in Denver, and another concert in Arizona with Cook da Books. That year she released her next album, Secret Secrets. The album was a top 20 hit but failed to yield any hit singles, cementing Armatrading's status as an "album artist". Taking over production responsibilities herself, she recorded the albums Sleight of Hand (1986), The Shouting Stage (1988) and Hearts and Flowers (1990) for A&M Records, which all made the UK Top 40 but failed to achieve the level of commercial success of her earlier works despite successful national tours (a show from her 1988 "Shouting Stage" tour was also filmed for television). In 1989 she was the guest of Sue Lawley on the BBC Radio 4 radio programme Desert Island Discs where her favourite choice was Van Morrison's "Madame George". Armatrading's full list included Ella Fitzgerald and Gustav Mahler. Her luxury item was a guitar, while her castaway's book was Why Didn't They Ask Evans? by Agatha Christie. In 1991, A&M released the compilation The Very Best of Joan Armatrading which returned her to the Top 10. However, her following studio album for A&M, 1992's Square the Circle, did not replicate this success and would be her final recording for the label. Following her departure from A&M, a label she had been with for almost 20 years, Armatrading signed with RCA for her 1995 album What's Inside. Despite various television appearances and a full tour (which included a string quartet in addition to her stage band), the album was not a commercial success, becoming her lowest charting studio album in 20 years. In December 1998, she released Lullabies with a Difference, an album of lullabies contributed by her and several of her favourite artists, in honour of PACES, a charity for children with cerebral palsy. In 2003, no longer attached to a major label, she released the album Lovers Speak. Though it was her first album in eight years, it met with little commercial success. In 2004, she released a live album, Live: All the Way from America, which was a recording of a concert from her Lovers Speak tour. Her 2007 album Into the Blues debuted at #1 on the US Billboard Blues Chart, making Armatrading the first UK female artist to earn that distinction. Into the Blues, which Armatrading called "the CD I've been promising myself to write for a long time", was nominated for a Grammy Award, also making her the first female UK artist to be nominated in the Grammy Blues category. In 2007 Armatrading appeared in Episode 3 of the second series of Live from Abbey Road performing "Tall In The Saddle" from her 1976 self-titled album, and "Woman In Love" from the album Into The Blues. She also appeared on Later... with Jools Holland where she performed "Love and Affection", as well as "Woman In Love" and "My Baby's Gone" both from her 2007 Into The Blues album. In 2008 she was part of Cyndi Lauper's True Colors Tour 2008. On 29 March 2010 she released a new album, This Charming Life. The album peaked at #4 on the US Billboard Folk Albums chart. She embarked on an international tour to promote it, and a concert from this tour in April 2010 at the Royal Albert Hall in London was released on the CD/DVD album Live at the Royal Albert Hall, along with two tracks from a concert in Denver, Colorado, US, in February 2011. In 2012, she released the album Starlight. Armatrading has always supported new music and local talent. For her 2012 Starlight tour she invited 56 singer–songwriters/artists to open for her in their respective home towns before her main tour support Chris Wood. Each of the artists opening for her across the UK also had a track selected for a three disc compilation released by her record label Hypertension Music. She presented Armatrading's Singer-Songwriters, a two-part radio series showcasing these artists, which was broadcast on BBC Radio Two in February 2013. In 2014 and 2015, Armatrading embarked on her last major tour, the Me Myself I Tour, the first to feature her solo on stage. An accompanying CD/DVD album, entitled Me Myself I World Tour, was released in 2016. In 2016, Armatrading was commissioned by director Phyllida Lloyd and the Donmar Warehouse to write the music to an all-female production of William Shakespeare's The Tempest. Armatrading released an accompanying digital album, The Tempest Songs. In 2018, she signed to BMG. Her first album for the label, Not Too Far Away, was released in May 2018. In addition to recording, Armatrading has toured extensively and appeared in high-profile concerts such as "The Picnic at Blackbushe" in 1978 (alongside Bob Dylan and Eric Clapton) and The Prince's Trust Rock Gala in 1983. She also appeared in the film The Secret Policeman's Third Ball in 1987. She has also made many appearances on television, including The Old Grey Whistle Test in 1975, "Joan Armatrading: Rock Over Europe" in 1980, "Joan Armatrading in Concert" in 1982, "Late Night in Concert" in 1984, "Joan Armatrading" in 1985 and "In Concert" in 1988. Armatrading presented a five-part series on BBC Radio 4 called Joan Armatrading's Favourite Guitarists which was broadcast in July 2009, in which she talked to guitarists about their music and their technique. She followed this up with another five-part series called Joan Armatrading: More Guitar Favourites, which was broadcast in November and December 2011. On 19 May 2015 Armatrading appeared on BBC Two's Later... with Jools Holland, singing "Me Myself I". On 11 May 2018 she was a guest on BBC One's The Graham Norton Show and performed her new single "I Like It When We're Together". Armatrading possesses the vocal range of a contralto. Her music draws on a wide range of influences including rock, folk, jazz, blues, soul, and reggae. Her songs have been described as "some of the most deeply personal and emotionally naked ... of our times". In a 2003 interview, she said: "My songs aren't about me at all. They're always about love, the pain and anguish of it. But the way I've always written is from observation. They're about what I see other people going through. If the songs were about me I'd be so embarrassed I don't think I'd be able to walk out the front door." She went on to say: "the optimistic songs reveal a bit more of me because that's how I feel. I'm definitely a 'glass is half full' kind of a person." Many of her lyrics do not specify the gender of their subjects and she frequently uses the word "you" rather than a gender pronoun. Armatrading performs on both six- and twelve-string acoustic and electric guitars. She has played on Ovation acoustic instruments since 1973, and said this about them in an interview with the magazine Guitar Player: "I'm a bit of a hitter, you see – I bash – and I like to have everything going at once: bass, harmony, and melody. This is why I love Ovations. They are very powerful-sounding guitars, and when I hit those strings, they ring with a nice, clear, percussive – but not overly bright – sound that highlights the rhythms I like to play." She has played Stratocaster and Gibson electric guitars. For her 2012–13 tour, she performed on six- and 12-string Ovations, Stratocasters, and customised Tom Anderson guitars, while for her 2014–2015 Me Myself I Tour, she performed on Ovation and Variax instruments. People who like my music have a legitimate interest in me, but I need to retain some privacy, not to be telling people what's going on, or what I feel. When you go home, the reason it's beautiful is because it's personal to you and the people you want to include in it. In addition to her music career, in 2001, after five years of studying, Armatrading gained a BA degree in History from the Open University, of which she is now a trustee. Between 2005 and 2010, Armatrading served as president of the Women of the Year Lunches. In April 2011, The Shetland News reported that Armatrading and girlfriend Maggie Butler were to enter a civil partnership on 2 May 2011, in the Shetland Isles. A younger brother, Tony Armatrading is a stage, screen, and television actor who now lives in Los Angeles. Armatrading performed as a cameo vocalist for the song "Don't Lose Your Head" on the 1986 Queen album A Kind of Magic. In 1997, she made an appearance on the charity single "Perfect Day". Armatrading's song "In These Times" from her 2003 album Lovers Speak, appeared on the compilation album Songs for Tibet: The Art of Peace which was released in 2008  by The Art Of Peace Foundation. Armatrading has been nominated three times for a Grammy Award and twice for a Brit Award as best female vocalist. She received an Ivor Novello Award for Outstanding Contemporary Song Collection in 1996. She has received honorary degrees from the Liverpool John Moores University (2000), the University of Birmingham (2002), the University of Northampton (2003), Aston University (2006), the Royal Scottish Academy of Music and Drama (2008), and the Open University and the University of the West Indies (2013). She was made a Member of the Order of the British Empire (MBE) in 2001. In October 2011, Armatrading was presented with a BASCA Gold Badge Award in recognition of her contribution to music. In May 2012, before her concert at Uttoxeter, as part of the 2012 Acoustic Festival of Britain, she was presented with a Lifetime Achievement Award. In April 2016, she was presented with a Lifetime Achievement Award at the 2016 BBC Radio 2 Folk Awards in recognition of her "influence on a generation of singer-songwriters [as] one of the outstanding voices in British music since the 1970s". ^ Lindsey, Craig D (13 July 2000). "Union Joan". Houston Press. Retrieved 31 October 2011. ^ a b c d Birch, Helen (4 November 2005). "Interview: Joan Armatrading". The Guardian. Retrieved 29 April 2011. ^ a b c Thomas, David (27 March 2003). "Reluctant exposure". The Daily Telegraph. Retrieved 11 August 2011. ^ McVeigh, Sarah (26 March 2013). "Joan Armatrading speaks to Richard Glover about music, love and affection". ABC Sydney. Australian Broadcasting Corporation. Retrieved 25 October 2013. ^ a b c Mendez, Serafín; Cueto, Gail; Rodríguez Deynes, Neysa (July 2003). "Joan Armatrading (1950–) St. Kitts Singer and Songwriter". Notable Caribbeans and Caribbean Americans: a biographical dictionary. Greenwood Publishing Group. pp. 22–24. ISBN 978-0-313-31443-8. Retrieved 27 September 2011. ^ Tuber, Keith (September 1983). "Joan Armatrading hopes The Key finds success". Orange Coast Magazine. Emmis Communications: 130–131. ISSN 0279-0483. Retrieved 27 September 2011. ^ a b c d Brown, Helen (27 August 2005). "Don't drop the pilot!". The Daily Telegraph. Retrieved 29 April 2011. ^ a b "Joan Armatrading is looking for new talent". Birmingham Mail. 15 July 2011. Retrieved 27 September 2011. ^ Dargue, William. "Brookfields". History of Birmingham Places & Placenames A to Y. Retrieved 12 January 2013. ^ a b c "Up close and very personal". The Scotsman. 9 March 2003. Retrieved 1 January 2013. ^ Chilton, Martin (28 April 2016). "Joan Armatrading interview: I ignored advice to change my name". The Daily Telegraph. Retrieved 23 August 2018. ^ a b c d "Joan Armatrading (b. 1950)" at the National Portrait Gallery, London. ^ Joan Armatrading biography at AllMusic. Retrieved 28 September 2011. ^ a b c d Strong, Martin C. (2000). The Great Rock Discography (5th ed.). Edinburgh: Mojo Books. pp. 29–30. ISBN 1-84195-017-3. ^ "31/10.1974 Joan Armatrading – Keeping It Peel at bbc.co.uk". Retrieved 11 May 2018. ^ "BBC - Radio 1 - Keeping It Peel - 14/01/1974 Joan Armatrading". www.bbc.co.uk. Retrieved 11 May 2018. ^ "SNL Season 02 Episode 21 – Shelley Duvall, Joan Armatrading". NBC. Retrieved 26 November 2017. ^ "Rockpalast Archiv" (in German and English). Rockpalast. Retrieved 3 November 2012. ^ Box Score Top Grossing Concerts. Billboard. Nielsen Business Media. 1 June 1985. pp. 48–. ISSN 0006-2510. ^ "Joan Armatrading, Desert Island Discs - BBC Radio 4". BBC. Retrieved 11 May 2018. ^ The full list was Violin Concerto in E Minor by Felix Mendelssohn, "That Old Black Magic" by Ella Fitzgerald, "Madame George" by Van Morrison, Symphony No. 4 in G major by Gustav Mahler, The Magnificent Seven theme by the Cincinnati Pops Orchestra, "Dies irae" (from Requiem Mass) by Giuseppe Verdi, "I'm a Man" by Muddy Waters and Symphony No. 9 in E minor (from The New World) by Antonín Dvořák. ^ "Joan Armatrading Artist Profile". Harmony Ridge Music. Retrieved 16 April 2013. ^ Jurek, Thom. Review of Live at Royal Albert Hall at AllMusic. Retrieved 5 May 2011. ^ "Starlight: Joan Armatrading". Amazon.co.uk. Retrieved 30 May 2012. ^ "Joan Armatrading Supports Local Talent on her September to November 2012 UK and Ireland tour". LocalTalent. Retrieved 8 November 2012. ^ "Joan Armatrading presents 56 singer/song-writers of the Local Talent". Propermusic.com. Retrieved 8 November 2012. ^ "Armatrading's Singer-Songwriters – Episode guide". BBC. Retrieved 20 February 2013. ^ a b "Joan Armatrading Readying The Release Of 'Me Myself I World Tour' DVD And CD Set For Release". 429 Records via PR Newswire. 14 October 2016. Retrieved 3 February 2017. ^ a b "One woman, one guitar: Joan Armatrading goes it alone on yearlong world tour". Guitar Girl Magazine. 19 April 2015. Retrieved 27 April 2018. ^ Taylor, Paul (23 November 2016). "Shakespeare Trilogy, Donmar King's Cross, London, review: No queue for returns is more worth joining than the Saturday marathons". The Independent. Retrieved 3 February 2017. ^ "About Joan". Joan Armatrading's website. Archived from the original on 20 March 2018. Retrieved 20 March 2018. ^ "Not Too Far Away". AllMusic. Retrieved 12 May 2018. ^ "Joan Armatrading: The Concert (1988)". British Film Institute. Retrieved 16 November 2014. ^ "Joan Armatrading's Favourite Guitarists". BBC Radio 4. Retrieved 3 May 2012. ^ "Joan Armatrading: More Guitar Favourites". BBC Radio 4. Retrieved 3 May 2012. ^ "Later... with Jools Holland, Series 46, Episode 6". BBC. 19 May 2015. Retrieved 20 May 2015. ^ "Episode 6, Series 23, The Graham Norton Show - BBC One". BBC. Retrieved 11 May 2018. ^ Pareles, Jon (26 August 1988). "Review/Pop; Armatrading at Pier 84". The New York Times. Retrieved 26 July 2012. ^ Connell, John; Gibson, Chris (2003). Sound Tracks: Popular Music, Identity, and Place. London: Routledge – via Questia (subscription required). p. 218. ISBN 0-415-17027-3. Retrieved 1 January 2013. even where lyrics were gender-free, as in much of the music of Joan Armatrading or George Michael, performers dismissed discussions of their sexual identities. ^ Walsh, John (27 July 2009). "Guitar hero – the radio tour". The Independent. Retrieved 1 January 2013. ^ a b c "Gearbox: equipment picks from Joan Armatrading". Acoustic Guitar (43). July 1996. Archived from the original on 4 April 2009. Retrieved 1 January 2013. ^ "Joan Armatrading". Guitar Player – via Questia (subscription required). 38 (12). December 2004. Retrieved 1 January 2013. ^ Fitzgerald, Eric (13 September 2012). "Joan Armatrading... legendary singer, songwriter and guitarist". Limerick Post. Archived from the original on 20 September 2012. Retrieved 1 January 2013. ^ Birch, Helen (4 November 2005). "Joan Armatrading: 'I prefer birdsong to chatter'". The Guardian. London. Retrieved 6 May 2015. ^ "Joan Armatrading to marry girlfriend". Lesbilicious. 25 April 2011. Retrieved 25 April 2011. ^ Marter, Hans (21 April 2011). "Joan Armatrading to 'tie the knot' in Shetland", The Shetland News. Retrieved 18 January 2013. ^ "Tony Armatrading". British Black and Asian Shakespeare Performance Database. Retrieved 17 September 2018. ^ "Various – Songs For Tibet: The Art Of Peace (Wisdom. Action. Freedom.)". Discogs. Retrieved 24 May 2015. ^ "songs Archived 28 February 2015 at the Wayback Machine". The Art of Peace Foundation. Retrieved 24 May 2015. ^ "Awards". Joanarmatrading.com. Archived from the original on 29 October 2013. Retrieved 25 October 2013. ^ "No. 56237". The London Gazette (Supplement). 16 June 2001. p. 13. ^ "Great acts lined up for the Acoustic Festival of Britain". Safeconcerts. 9 April 2012. Retrieved 5 October 2012. ^ "Mark Knopfler to perform at the Radio 2 Folk Awards 2016". BBC. 24 March 2016. Retrieved 28 April 2016. ^ Booth, Al (26 April 2016). "About the BBC - Radio 2 Folk Awards 2016 at Royal Albert Hall". BBC Blogs. Retrieved 28 April 2016. Top 100 (Kent Music Report) peaks to 19 June 1988: Kent, David (1993). Australian Chart Book 1970–1992 (Illustrated ed.). St. Ives, N.S.W. : Australian Chart Book. p. 19. ISBN 0-646-11917-6. N.B. The Kent Report chart was licensed by ARIA between mid 1983 and 19 June 1988. Top 50 (ARIA) peaks from 26 June 1988: "Discography Joan Armatrading". australian-charts.com. Hung Medien. Retrieved 13 January 2016. Top 100 (ARIA) peaks from January 1990 to December 2010: Ryan, Gavin (2011). Australia's Music Charts 1988–2010. Mt. Martha, VIC, Australia: Moonlight Publishing. 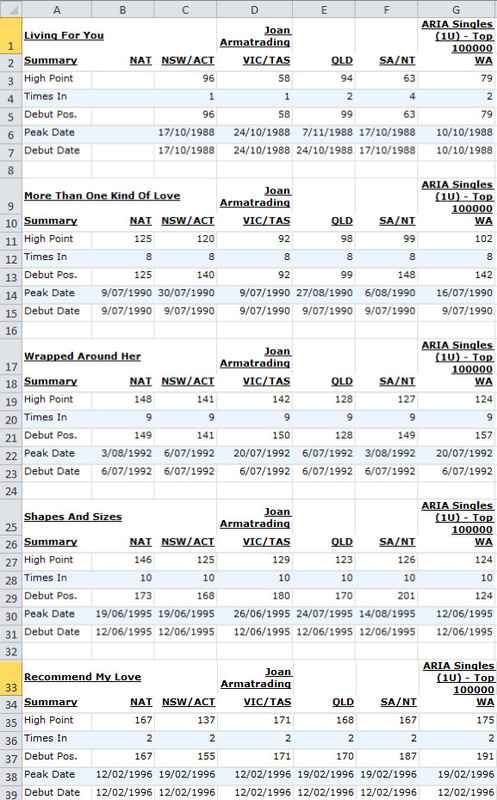 "More Than One Kind of Love", "Wrapped Around Her", "Shapes and Sizes" and "Recommend My Love" (ARIA) peaks: "Response from ARIA, re: chart inquiry, received 22 August 2017". Imgur.com. Retrieved 22 August 2017. N.B. The number in the NAT column represents a release's peak on the national chart. ^ "dutchcharts.nl – Discographie Sting" (in Dutch). Hung Medien. Retrieved 7 October 2011. ^ "Joan Armatrading". Austriancharts.at (in German). Hung Medien. Retrieved 14 January 2015. ^ "Joan Armatrading – Longplay-Chartverfolgung". Musicline.de (in German). Phononet. Retrieved 14 January 2015. ^ "Joan Armatrading". Norwegiancharts.com. Hung Medien. Retrieved 14 January 2015. ^ "Joan Armatrading". Charts.org.nz. Hung Medien. Retrieved 14 January 2015. ^ "Joan Armatrading – Classics Volume 21 (CD)". Discogs.com. Retrieved 30 July 2009. ^ Currin, Brian. "South African Rock Lists Website - SA Charts 1969 - 1989 Acts (A)". www.rock.co.za. Retrieved 11 May 2018. Mayes, Sean (1990). Joan Armatrading – A Biography (unauthorised). Weidenfeld and Nicolson. ISBN 0-297-81058-8. Wikimedia Commons has media related to Joan Armatrading.